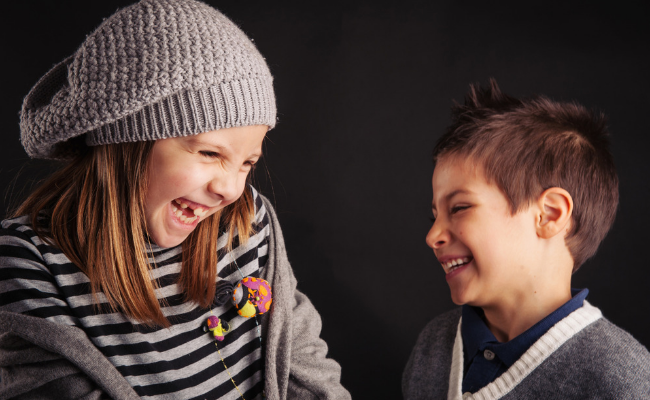 These fun Valentine’s Day jokes for kids will get your kids laughing out loud! They’re delightfully corny, but kids LOVE them! 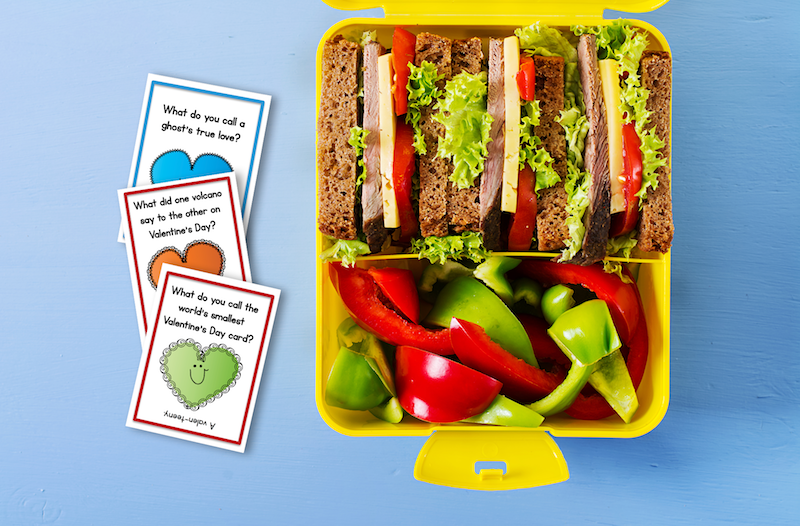 We’ve turned some of them into some fun printable lunch box jokes to use during February. We’ve also chosen two to make into classroom Valentines. Perfect for kids of all ages. Watching them crack up at their non-joke was enough to make me laugh along as well. They understood the rhythm, but hadn’t quite grasped the concept. It was hysterical and wonderful. As they grew up, so did their love of jokes, especially the totally corny ones. They loved those best, especially if they made me groan. 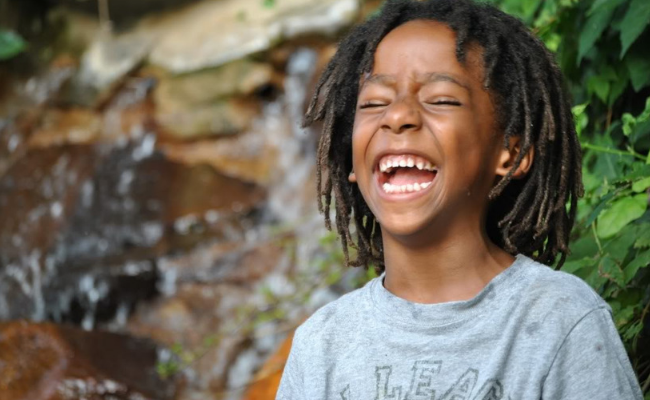 Every kid I’ve known has loved jokes and enjoy sharing them with the adults in their lives. It is a great way to get a quick moment of connection and there is nothing like laughter to make the day better. 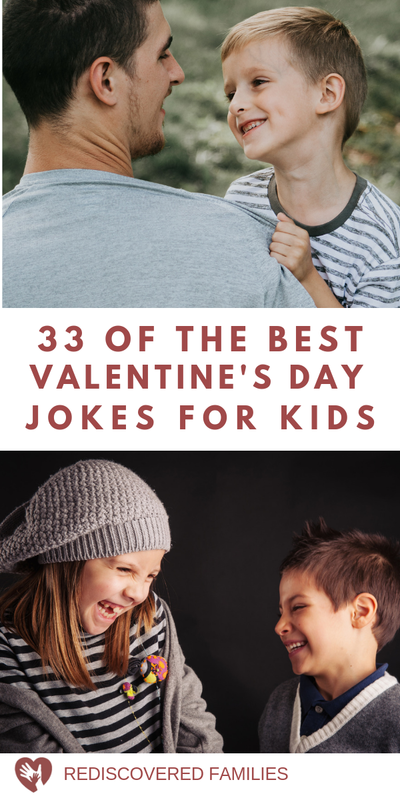 Valentine’s Day is coming up, so I went looking for the very best Valentine’s Day jokes for kids and came up with a great list. Memorize a few to share over supper, or at odd moments throughout the day. You’re sure to get a grin, laugh, and probably more than one eye roll. What did one flame say to the other on Valentine’s Day? We’re a perfect match. What do you call a ghost’s true love? His ghoul-friend. What kind of flowers do you never give on Valentine’s Day? Cauliflowers! What did one light bulb say to the other? I like you a watt. What did the girl squirrel say to her sweetheart on Valentine’s Day? I’m nuts about you! What did one oar say to the other? Can I interest you in a little row-mance? What flower gives the most kisses on Valentines Day? Tulips. What did one raspberry say to the other on Valentine’s Day? I love you berry much. What did one whale say to the other on Valentine’s Day? Whale you be mine! What did one owl say to the other on Valentine’s Day? Owl be yours! Why didn’t the skeleton send any Valentine’s Day cards? His heart wasn’t in it. What did one cat say to the other on Valentine’s Day? You’re purrfect for me! 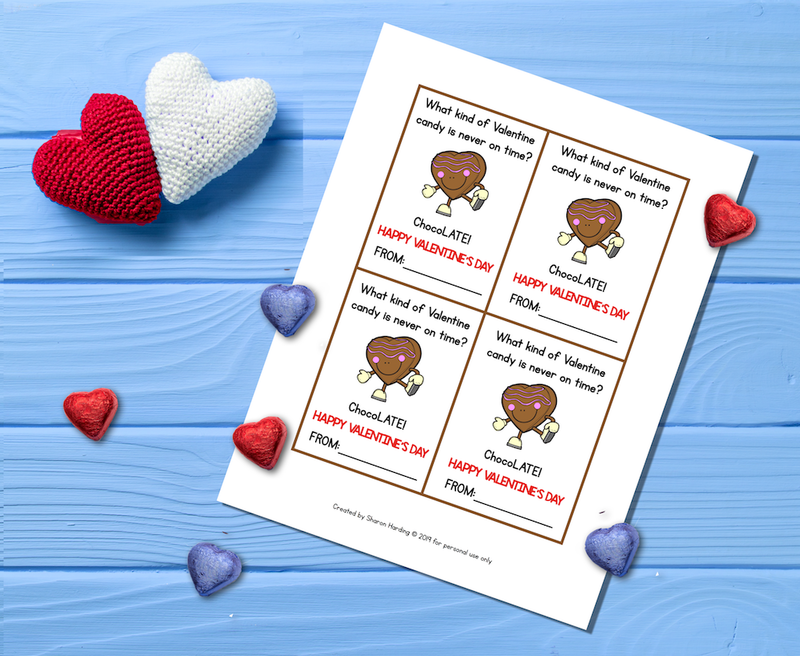 These corny jokes also make great Classroom Valentines, so I created two for you to choose from. They are suitable for both boys and girls and super easy to make. Simply download the file, print and cut into cards. Have your child sign their name and you are good to go. The first features a calculator and pencil. It would be great to pair with a fresh new pencil. The second has a cute Valentine chocolate, so it would be good to pair with sweet treat. 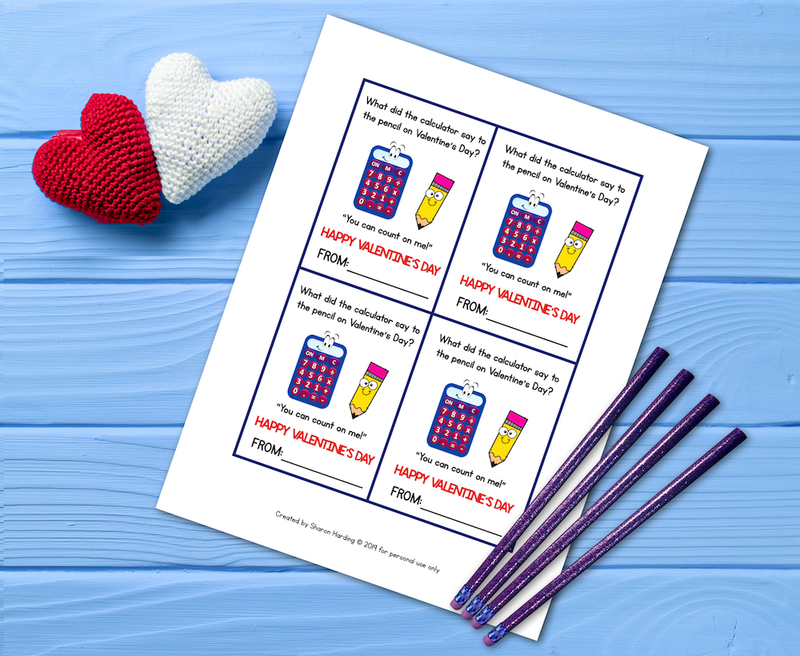 Click here to Download the Printable Valentine package. 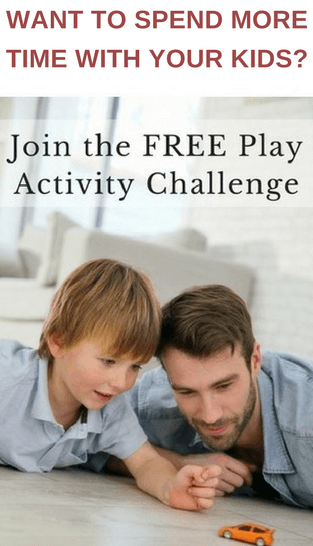 Do your kids like funny videos? This wacky video starring DJ duck will make them laugh. It is full of silly Valentine’s Day jokes. 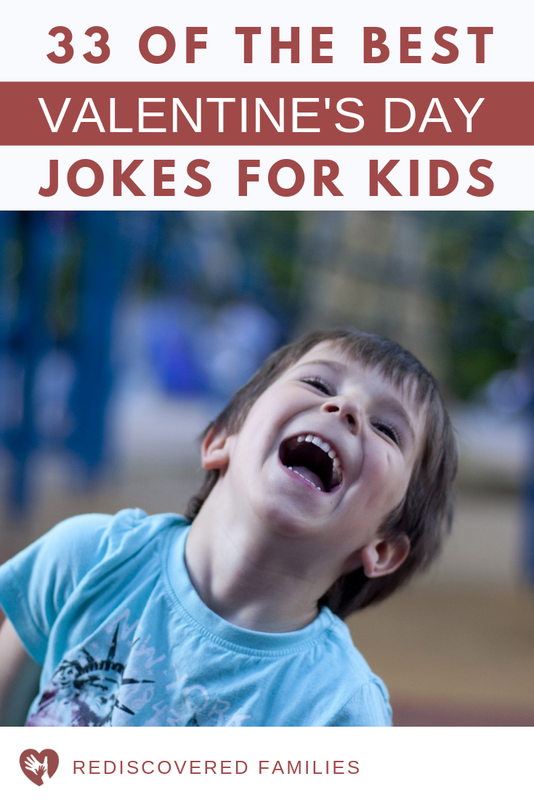 The offbeat humour will probably appeal to your kid’s funny bone. What is about knock, knock jokes and kids? They were the first kind of jokes my boys started telling and they were so impressed with them. Valentine’s day definitely has some of the corniest knock knock jokes out there! 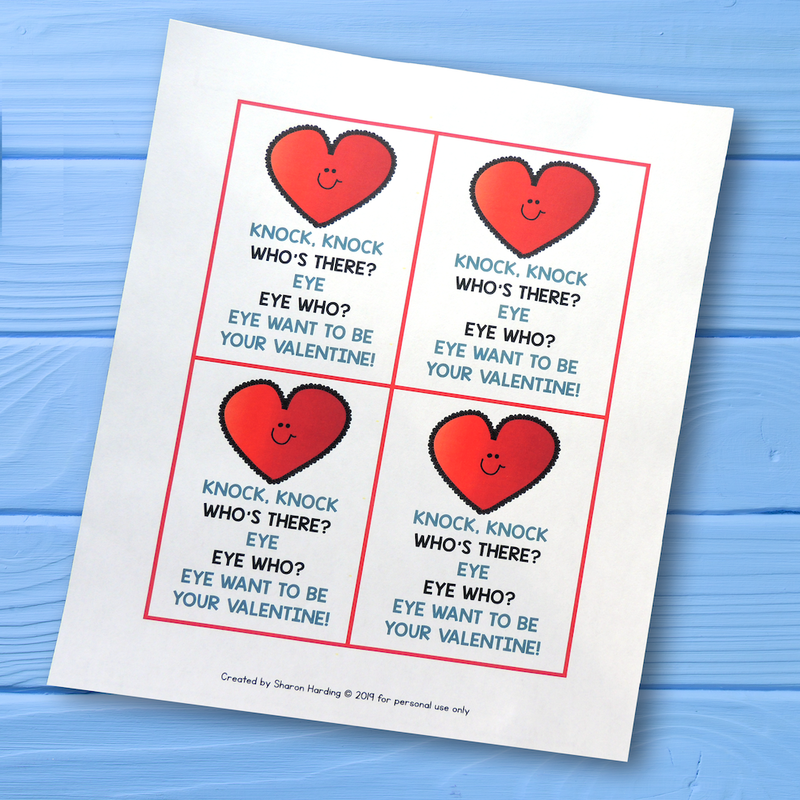 I’ve included 2 pages of knock knock jokes in with the printable package. Click here to get your printable pack. Al be your Valentine if you’ll be mine. Want to do something special with these jokes? Modern Parents messy kids has taken some Knock, Knock Valentine jokes and made a fortune teller with them. Grab the free printable here. Alec to kiss your cheek. Egg-cited to be your Valentine. Honeydew you want to be my Valentine? Do you have any Valentine’s Day jokes to share? What kinds of jokes do you kids like? Leave a comment below. 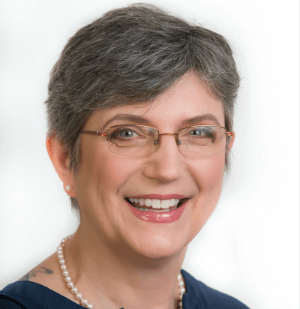 i use it all the time when i travel to find great rooms for the entire family and great deals. they have some amazing houses and condos to rent almost anywhere you wan to go.